Can we leave in 2017 the narrative that we don't support Black businesses. Black people will show up and show out for our own, especially when the business is well executed and filling a void within the community. Case and point, the opening of Uncle Bobbie's Coffee & Books by Marc Lamont Hill in Uptown Philly. UBCB is the only Black owned coffee shop and bookstore that I have knowledge of in the Germantown/Uptown area. In a social media age where print publications are going out of business and bookstores are dwindling, it was definitely a gamble betting on books in an area of the city where I'm sure most would wrongly assume people don't read. As a professor at Temple University, one of the hot beds for gentrification in the city, it would have been so much more expedient and less risky to open a store there first. The fact that Dr. Hill chose Germantown to launch this enterprise, a neighborhood that is not actually on the city's most hip and rich places to live says a lot about him. Having grown up in North Philadelphia and now a firm West Oaklane resident myself, it's refreshing to see many beginning to understand the importance of investing and bringing business to what many now call the "middle neighborhoods". I'm hoping this is a trend that other celebrities from the city (*cough cough* Jilly from Philly and Will) start to hop on...and soon. In the meantime, I'm just happy that when my girls' or a fellow member of the Working Educators of Philadelphia (a Caucus within the Philadelphia Federation of Teachers) call me and say lets meet, I don't have to travel all the way to the hip spots in West Philadelphia to do it. Wednesday marked my second visit to the bookstore. My friend Angie called me the day before and suggested we have a quick meet-up after school so she could give me something top secret. The first place we both thought of for a meeting was Uncle Bobbie's. Since I teach at Northeast High School, I left shortly after my last classed dismissed for the day...sometime around 3:00 and it took me about 31 minutes to get there. I was shocked that I found parking so close to the store but not surprised that upon walking inside there were a ton of folks there already including Dr. Hill himself. Angie had coffee but since I'm a reformed no coffee drinker of two years, I got hot chocolate instead. You'd think I would have remembered to ask from jump to have it sweetened. If you're confused as to why hot chocolate from the pack would need to be sweetened...don't feel bad, I was too. Now, apparently, after recounting this story to Matt, I'm uncultured about the ways of a real coffee shop because to use bagged hot chocolate is an insult. That's right, hot chocolate from UBCB's is made from real cocoa yal, and as the sweet woman who took my order informed me during my first visit, "sugar needs to be added honey". In any case, the reason for Angie's requested meeting gave me all the feels and warm fuzziness needed after teaching 140 ninth graders World History all day. She presented me with Kwanzaa gifts that included handwritten notes, and poems (some written by her) within the pages. This woman is a godsend. I couldn't fully express to her how much I loved the thought she put into her gift giving. Seriously, the woman downloaded a picture of me from FB and added it to a collage she put on a notebook that featured Black Women she thinks were/are awesome. At a time when it's a necessity for Black women to hold on to their village, her passion and advice have been timely and comforting. 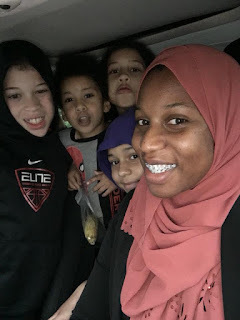 In fact, in the wake of the death of activist and daughter of the Black Lives Matter movement Erica Garner, I'm reminded that we don't do enough of caring for our sisters nor do we do enough of caring for ourselves. Her death was a reminder to all of us that we need to build a support system among other Black women and also indulge in radical self-care. I consider Angie one of the many women within my circle that I can turn to for advice and lately God has been using her to help affirm the new path I'm cautiously walking. Yes...her gifts were perfect for all the right reasons and I can't wait to share how they relate to a new venture I'm pursuing. 1. Black folks are always rooting for other Black folks and all of us in Philly are rooting for and showing out for Uncle Bobbie's Coffee and Books, if you haven't been there...get there. 2. Black women need to indulge in radical self care and part of that business is recognizing your village, leaning in to them, and meeting them for some coffee...preferably at Uncle Bobbie's. 3. Angie is a mind reader, part of my village and her passion inspires me on a daily to keep it pushing. *For more info, be sure to click the links in the above post.